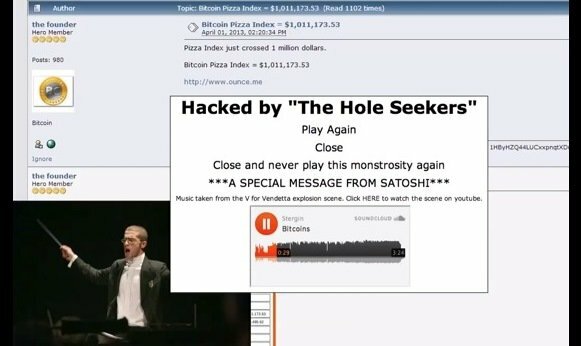 Forum BitcoinTalk.org is down after being hacked by "The Hole Seekers"
One of the most famous virtual meeting points for Bitcoiners around the world has been hacked. BitcoinTalk.org was attacked this Wednesday (2) by a group called “The Hole Seekers”. According to users who shared information here and also as reported by the website Cryptolife, the forum played an apparently harmless flash animation to the visitors. However, the platform has been shut down while the consequences of the attack aren’t reversed. It’s unfortunately worse than I thought. There’s a good chance that the attacker(s) could have executed arbitrary PHP code and therefore could have accessed the database, but I’m not sure yet how difficult this would be. I’m sending out a mass mailing to all forum users about this. Here’s what I know: the attacker injected some code into $modSettings[‘news’] (the news at the top of pages). Updating news is normally logged, but this action was not logged, so the update was probably done in some roundabout way, not by compromising an admin account or otherwise “legitimately” making the change. Probably, part of SMF related to news-updating or modSettings is flawed. Possibly, the attacker was somehow able to modify the modSettings cache in /tmp or the database directly. Also, the attacker was able to upload a PHP script and some other files to the avatars directory. Figuring out the specifics is probably beyond my skills, so 50 BTC to the first person who tells me how this was done. (You have to convince me that your flaw was the one actually used). According to ‘theymos’, the forum won’t go back up until he knows what happened for sure, “so it could be down for a while”. In the meantime, you can check a video that shows the hack here. There’s even music.